Cambridge, UK, Wednesday, 3 May, 2017 – BrightSign, LLC®, the global market leader in digital signage media players, today announced that its players have been chosen for a digital signage rollout at Vue Entertainment, one of the UK’s largest cinema chains. Digital Signage based on BrightSign XD232 players supplied by Midwich has been installed by system integrator 360 Digital in eleven Vue Cinemas, including a new site in Darlington. Vue Entertainment is transitioning from using static posters and low resolution retail advertising as promotional platforms, to digitising across their estate of 85 cinemas in the UK. The chain initially commissioned 360 Digital to roll-out digital signage based on BrightSign players to ten sites. This project included digitising static posters already in place, installing a nine screen video wall and upgrading the current retail advertising. With the ten site roll-out a success, Vue asked 360 Digital to create a specification for a new-build cinema in Darlington. Vue Entertainment has also invested in BrightSign Network Enterprise Edition, allowing them to host content for distribution to their cinemas. “Vue is very pleased with the installation and overall solution for all digital sites, and is planning a further roll-out. The content deployment and technical services teams manage the network on a day-to-day basis with very few issues,” said Terry Podesta, Director of 360 Digital. “The BrightSign XD232 system was an ideal recommendation to Vue as this was without doubt the most capable player and offered the best value for money. Vue is currently our only UK client to be hosting their own content using the BrightSign Network Enterprise Edition server software. The quality of the BrightSign solution gave them the confidence to make this investment and commit to standardizing on BrightSign for all future digital signage installations,” continued Terry Podesta. Vue uses a range of content; mostly HTML5 and video, which delivers in-house promotions on snacks, merchandise and memberships. A small team is able to manage playback from one office, supporting the entire network. Specific movies and advertisements can be displayed depending on the time of day and/or type of movie being shown, ensuring relevant advertising is being delivered to the right audience, at the right time. A big advantage of the digital platform is the ease with which specific promotions like movie premier takeovers can be implemented. Historically, all posters on-site would be changed for each movie. Of course, now this can happen almost instantaneously and does not require a team replacing posters. “Vue’s decision to install Samsung video wall displays, powered by BrightSign digital signage, reinforces their vision to be the people’s first choice for cinema entertainment. It was important that the technology was easy to use and would create a powerful, reliable platform to communicate to their customers,” added Mark Flowers, Business Development Manager for Retail Solutions at Midwich. “Midwich were invaluable in demonstrating and supplying top-rated brands of hardware and networking solutions, along with technical support and training where required. The logistics of stocking and delivering large quantities of hardware to each site was a big help and ensured we could focus on the installations,” concluded Terry Podesta. The exact configuration and specification of the signage depends on the size and layout of each location. The Darlington site features 13 individual Samsung UE55D screens installed and synchronized on the retail stand for food, drink and film time advertising. 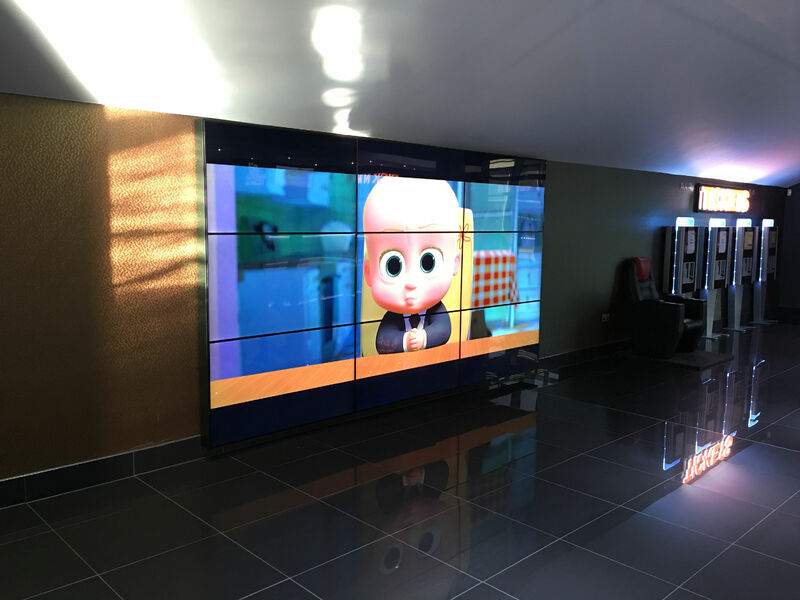 A nine screen video wall, also with frame-accurate synchronization by BrightSign, was added to showcase movie trailers within the foyer, enticing customers to return for the latest movie releases. All screens are driven from networked BrightSign XD232 players, in Full HD resolution. The project is continuing into 2017 with further UK sites joining the BrightSign Network.